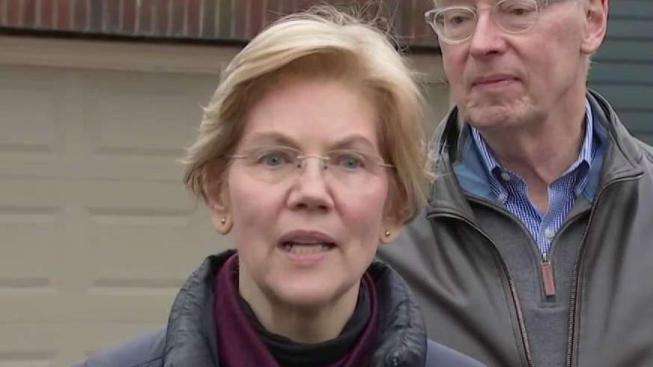 U.S. Sen. Elizabeth Warren discussed her decision to form an exploratory committee for the 2020 campaign outside her Cambridge, Massachusetts home on Monday. The Massachusetts Democrat says she's forming an exploratory committee for the 2020 campaign. She's the most prominent Democrat yet to make such a move. The Cambridge resident discussed her decision at a media event outside her home Monday afternoon. "I never thought I would run for anything ever in my life. But America's middle class is getting hollowed out and opportunity for too many of our young people is shrinking," Warren said standing with her husband Bruce Mann and their dog Bailey. "Right now Washington works great for the wealthy and the well-connected. It's just not working for anyone else." When asked how she plans to compete against President Donald Trump she said the plan is to get out and talk with voters. "I think the central part of winning this is to get out and talk with people about what we're fighting for. We want a government that works not just for the rich and the powerful but a government that works for everyone," said Warren. "And we can make that happen. We have to do that together. I think that's how we win." Warren released a YouTube video announcing her exploratory committee earlier in the day. "In our country, if you work hard and play by the rules, you ought to be able to take care of yourself and the people you love," Warren said in the video. "That's a fundamental promise of America. A promise that should be true for everyone. Warren burst onto the national scene a decade ago during the financial crisis with calls for greater consumer protections and quickly became one of the party's more prominent liberals. Now, as a likely presidential contender, she is appealing to the party's base. A video released Monday announcing her move notes the economic challenges facing people of color along with images of a women's march and Warren's participation at an LGBT event. Warren's announcement garnered mixed reactions from her home state of Massachusetts as well as in her Cambridge neighborhood. "As a first woman president, I don't think you could do any better than that," said Cambridge resident Glenn Becker. Although Warren appeals to Cambridge resident Sandy Migliaccio, she said she does not believe the senator can appeal to a broad base of voters. "I like her, I voted for her, I will vote for her again," said Migliaccio. "But I don’t think she's a good choice for president." Irene Cross, also of Cambridge, said she supports Warren but also does not believe the country is ready for a woman to be president. "It's got to be a man to run," Cross said. "I hate to say it but the countries really misogynistic right now." Resident Glenn Becker does not agree. "Doesn't take it from Trump," Becker said. "She doesn't take it from anyone who dishes out the kind of stuff that gets dished out in today's sort of Jerry Springer show like for my politics."